Later this year, we’ll release Ogre 6th Edition. 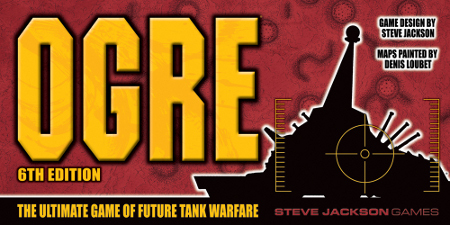 It will be a very, very deluxe boardgame, with all the rules and units from Ogre, G.E.V., and Shockwave, as well as things that have only appeared in magazines and miniature releases. Why? Because I want to. Ogre was my first design, and the boardgame version hasn’t been available for years. And people keep asking me for it. So some of our Munchkin money is going back to support the people who bought my very first game, by bringing them an edition with the best possible components. It won’t be “Euro” style. No meeples, no plastic. This will be the kind of hex wargame that we dreamed about 30 years ago, back when our heroes were SPI and Avalon Hill. HUGE double-sided map boards. HUGE full-color counters with HUGE type. A HUGE box to hold them in. And giant constructible Ogres! So why am I writing this letter? Not to say “Hey, distributors, we’ll do this if you like the idea.” I’m going to release this game, no matter what. If we don’t get enough distributor interest, we’ll release it for direct sales only, with (probably) a lower print run, and (certainly) a lower price, since we won’t have to build in the distributor and retailer margin. But I don’t want to bypass distribution. We went through this with GURPS Russia, back in ’98. When we solicited it, the distributors said “Meh.” We believed in the book, and printed a short run for direct sales. Suddenly everybody wanted it! It sold out quickly, distributors and retailers demanded it, and we ended up reprinting it for distribution! I won’t go through that again. It’s a humongous, heavy box that will have a huge shelf presence. How big is it? Over twice the size of Munchkin Quest. It takes three copies of the original edition of Ogre to cover up the word "OGRE" on this box. It’s got three huge mapboards with 1.5” hexes, and big full-color counters. The Ogre and building counters are 3-D constructible miniatures! I don’t expect to keep this in print. Realistically, I expect to print it once and let people spend the next 30 years fighting over the remaining copies. The people who get it are going to show it off at parties and conventions. It’s a pretty good game, if I say so myself. A lot of people remember it. (More than 25 years after its original release, Ogre won a spot in Hobby Games: The 100 Best.) Some of them would love to drop $100 for a beautiful version of the game they played 20 or 30 years ago, whether it was in high school, or in Germany or Kuwait or some classified spot in the middle of the Pacific. Talk to Ross at the GAMA Trade Show next week, and feel free to write directly to me at sj@sjgames.com. We've also created a sell sheet with more information; please note that the art, both on the sell sheet and above, is not final.